The industry standard Martin Mac 600 is a precision driven, yoke-mounted wash light offering 440° of pan and 306° of tilt with a fast and smooth movement. This mood and atmosphere generator produces a wide variety of colors and effects through instant, smooth positioning. 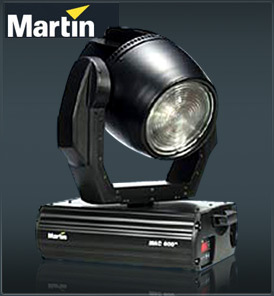 Along with the MAC 500, it is one of the most successful automated moving heads in the lighting industry. A unique CMY color mixing system creates virtually unlimited color shades and ensures uniform color mixing. Martin’s system software offers flexible color programming and a wide variety of color presets. The 4-position color wheel offers red, green and blue dichroic glass filters plus 5600/3200K color temperature correction. Three focal options are available - 18° near angle, 25° standard and 65° diffusion. No tools are required to change between them. The sidelight protector controls beam projection at the point of emergence by preventing unwanted light spill. A separate mechanical shutter allows for variable strobe up to 8Hz. The specially coated aluminum dimmer controls intensity from full open to blackout with microstep smoothness. [read more...] Dedicated anchoring points, a safety wire attachment point, a quarter turn fastening system and a mid-pan-range locator make for trouble free rigging. Convenient, secure snap-locks make for easy component accessibility. Maintenance is simple. A 4-digit LED readout allows the user to customize settings for easy programming. Error messages are easily understood, lamp and fixture usage is displayed and the readout flips for easy reading in any position. A powerful 575-watt discharge lamp provides up to 2000 hours of lamp life.